Pages tagged "winter bike week"
The week of January 29 has several great events going on AND there is only one municipal meeting because it's the fifth week of the month! So celebrate all the reasons winter biking is spectacular and get ready for Winter Bike Week, which starts Friday. February 2-4 the Clean Lakes Alliance hosts the annual Frozen Assets winter festival on the ice behind the Edgewater. Madison Bikes will be there, so come visit us. We’ll be doing sled pulls behind fat bikes on the ice, and we’ll have an information table at the event. 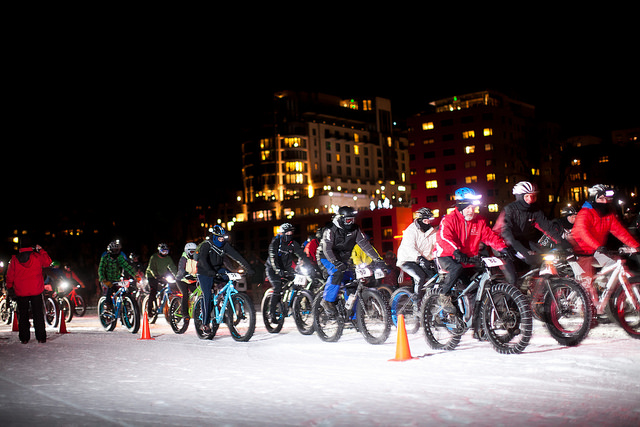 Friday night is the fat bike race, so come to participate or just watch the racers bike to Picnic Point and back. The regular MEAThead ride around Lake Mendota leaves from Fords Gym, 2114 Winnebago St, at 7pm for a Lake Monona Loop ride, with an optional loop through the Arboretum. This weekly ride continues through March. We’ll keep mentioning it here but put it on your calendar! Middleton Pedestrian/Bicycle/Transit Committee 6:30pm – 7:30pm at Middleton City Hall, 7426 Hubbard Ave, Middleton, WI. This meeting was scheduled for last week but changed due to scheduling conflicts. It is now on January 31st. The meeting does not appear on the City calendar but Kierstin Kloeckner has confirmed that the meeting is definitely happening. It just hasn’t made it to the calendar yet. Madison Winter Bike Week 2018 - The celebration of all things winter biking runs from February 2 – February 9. The Madison Bike Events committee is hard at work finalizing the details on commuter stations and other events. Look for updates on events and activities on the Madison Bikes website and Facebook page. Madison Winter Bike Week 2018 and Frozen Assets final day. Get out there and bike to the Edgewater to see the end of the festival! We are still planning events for the week, and we'll have an update later in the week, but you can see some of the great events at the Madison Winter Bike Week 2018 page. Winter Bike Week is back for 2019! From February 1 to February 8, we and our partners will bring a wide range of events that celebrate riding in the cold to you! Check back regularly for updates! Scroll down for the full list and details of the events. Want to add all Winter Bike Week events to your personal calendar? Other calendars: Download this .ics file and open it with your calendar app. On Friday February 1st the theme will be announced. For the week of winter bike week feel free to submit and vote for as many photos as you want that fit within the given theme. The top 3 photos based on reactions as votes will be printed out and voted on during the End-of-Week Happy Hour Celebration, then we will celebrate the final winner. Bloom Bake Shop - Monroe St.
Free coffee and mini doughnuts for cyclists from Monday to Friday - just bring in your helmet. Free small coffee, hot tea and energy bites for bicyclists. AND - 10% off Fish Fry and Beer/Wine on Friday Night, Feb 8, if you bike in and show off your helmet. Join our friends from the Clean Lakes Alliance for their third annual Frozen Assets Fat Bike Race on Lake Mendota, presented by Rayovac! The lit course will run from The Edgewater heading across Lake Mendota towards Picnic Point and back towards the UW-Madison campus and downtown Madison, all under the wide night sky. Choose from a 4.25 mile single lap or a 12.75 mile three-lap race and three different divisions. As always, proceeds supports work to protect our lakes. The race fee goes up to $50 on January 1st. As a special for Madison Bikes members, use code FAFB10 to get 10% off your registration before January 1. Update 1/16: The Clean Lakes Alliance has canceled all on-lake activities because of concerns about the ice. Sadly, this means we can't hold our sled pull. Madison Bikes is partnering with the Clean Lakes Alliance at the Frozen Assets Festival. For the second time, we'll be on frozen Lake Mendota to offer sled rides for kids -- pulled by fat bikes. Come with your kids or just watch! Let's celebrate Winter Bike Week by riding the Seminole trails together! This will be a relaxed meetup ride. Gather at the picnic table pre-ride. This ride will be postponed if the conditions are not right (too cold or too warm). Dress weather appropriately. Stop by our Bike Station (formerly known as commuter station) for free coffee, treats, and Winter Bike Week 2019 cheer on the Capital City Trail at Law Park. Ride begins at 7:00 in front of Ford's Gym. A no-drop Lake Monona loop, followed by an optional loop through the Arboretum around Lake Wingra. Free morning yoga class with Kierstin Kloeckner at Harbor Athletic Club in Middleton. Tuesday yoga from 6:30-7:15 am and Thursday Pilates from 6:30-7:15 am. Join Bike Fitchburg for hot drinks and bagels, free maps, and (empty) water bottles. Stop by Machinery Row Bicycles for coffee from Café Domestique and a free bike safety check. From 4-6:30pm, our friendly mechanics will be on hand to make sure your bike is safe, and your veins lightly caffeinated. Right on the bike path where Willy Street meets John Nolen Drive, Machinery Row Bicycles is happy to support Winter Bike Week. 7-9am enjoy free Coffee, churros, scramble eggs and chilaquiles at Canteen Taqueria & Tequila Bar, 111 S. Hamilton St.
Open and free to the public. Class taught by UW Bicycle/Pedestrian Coordinator Chuck Strawser. Learn the basics of cycling and keep yourself safe and comfortable while riding in traffic. Free Planet Bike blinky light set to the first five (5) attendees. Bring a bag lunch! 2 for 1 pints to anyone who bikes to the pub and shows their helmet. Free morning pilates class with Kierstin Kloeckner at Harbor Athletic Club in Middleton. Tuesday yoga from 6:30-7:15 am and Thursday Pilates from 6:30-7:15 am. Enjoy some light refreshments and in-store discounts on all winter cycling apparel and bike accessories. There will also be a raffle during the event! $1 off classics cocktails all night long, $4 all bottle purchases (until 9pm) -- just show that you biked and get the discount! 7-9am enjoy free Coffee, churros, scrambled eggs and chilaquiles at Canteen Taqueria & Tequila Bar, 111 S. Hamilton St.
Design Concepts will serve hot coffee with breakfast kabobs, clean/lube chains, and take your portraits! Make your ride count! Whenever you have the opportunity, try to ride past one of the bike counters. Feel free to share pictures of the bike counters with us. End-of-Week Happy Hour Celebration, 5-7pm at Bandung’s Nutty Bar, 600 Williamson St.
We will celebrate all things winter & cycling, and honor participants of the Winter Bike Week Photo Contest. Whether you are a winter biker or ally, come join in the fun!